Does the bin_full attribute ever change to true? My roomba 890 is missing the bin_full attribute, any ideas? Turn on debugging for roomba.roomba package and paste what you’re getting? I like that the new Roomba models can be controlled by voice, very cool. @xstrex Got a 896 and had issues with the missing bin_full attribute as well. I managed to find the problem: the roomba script checks for the entry “binFullDetect” in the capabilities, which is missing. Therefore it does not read out the entry “full” from the bin states, which does exist. I’m not sure what to make out of all those entries in the capabilities, so as a quick fix, I just made a custom component for roomba and removed this check. I’m getting the same error (Error 2 No such file or directory) but your fix has already been implemented…any ideas? 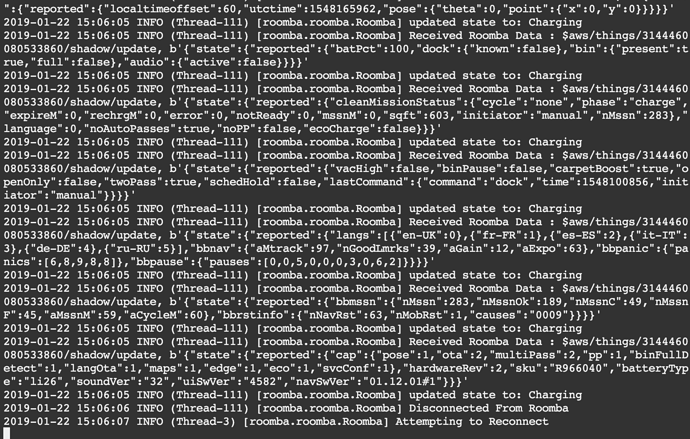 Looks like HA’s Roomba platform relies on roombapy v1.3.1 (reference, unless I’m mistaken) which hasn’t been updated since August 2017, so it doesn’t include @gooorooo’s fix. Unless you follow the instructions to update your virtualenv manually, I think the only way to fix is for @pschmitt to update roombapy on PyPI to include the latest changes from Roomba980-Python. I’m not exactly sure how easy that would be since I don’t know what changes went into his fork. All that said, others seem to be using it fine, though perhaps that is with an older version of HA. I’m on 0.83.1 and still see the [Errno 2] No such file or directory error when I add the Roomba platform to my config file. this works for me, though i’m still on homeassistant version 0.75.3. before this change i also got the FileNotFoundError while using the standard component. right after the Roomba() handler is created, works for me: the original library Roomba980-Python now also creates a map for me. 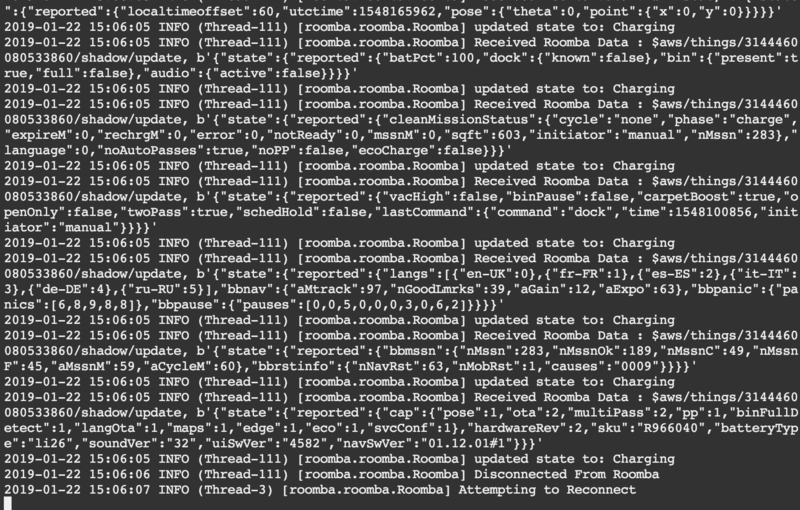 I am using https://www.home-assistant.io/components/vacuum.roomba/ component and I see in the log that it connects roomba every 5 seconds, when I set “continuous: false”, then it still connecting every 5 seconds to roomba to check status. I don’t want to check every 5 seconds the status of roomba. Is there any possibility to set status interval? Have you happened to have upgraded home assistant? I’m on the latest and can’t get this to work. I have followed your steps and see the custom component get loaded. I even see home assisant getting data from my roomba. The issue is though that my home assistant gui won’t come up when I have roomba enabled. Can you share your roomba.py so I can ensure mine looks the same? Thank you so much for this. Your version looks great but it causes the same issue for me. I can see it connect to the vacuum then locks up my home assistant. Any suggestions on how to view better debug logs? I am not sure if this is an issue with the latest home assistant or something unique in my setup. Edit: I spun up a test docker version of the latest home assistant and it works there. There has to be something funky with my setup but I have no clue what. Fixed my issue by installing ‘apt install python3-opencv’ outside my venv. does anyone know what all the possible ‘statuses’ are for the roomba? Has anybody managed to get a working cleaning map on Hassio/RPi?